If Santana and Los Lonely Boys had a child, they would name it The Plateros. 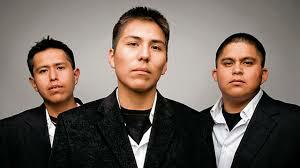 This three-piece power blues-rock trio hails from the eastern Navajo Nation. A family band, they formed in 2004 and made their mark the following year with an explosive 20-minute set on the “Reach The Rez” stage at Gathering of Nations, the world’s largest Powwow. Lead guitarist Levi Platero was just 12 at the time, screaming blues notes from the stage. Little did they realize that this memorable performance would be the first in a long musical journal that would take them from a small reservation in New Mexico to many stages in the U.S., including tours with Los Lonely Boys and a set at the 2009 Presidential Inaugural Ball. The band has won numerous honors, including two nominations at the Native American Music Awards, Best Blues Award at the 2009 New Mexico Music Awards, and a nomination for “Best Music Video” at the 2009 American Indian Film Festival. The band was also chosen to be part of the first Native American Music Tour sponsored in part by Hard Rock International.